Staci Stanger of Irrigon breaks into the open after being pressured by a strong Weston-McEwen defense. IRRIGON - The Irrigon Knights had a tough night Friday, January 16, 2009 as the Weston-McEwen Tiger-Scots came on strong from the opening tip to win 50 to 25. The height advantage was with the Tiger-Scots from the opening tipoff. 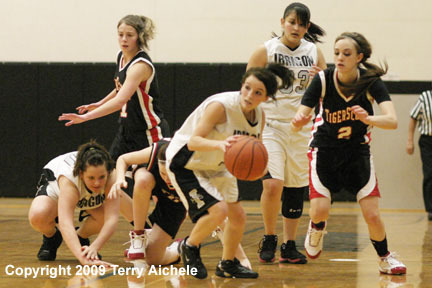 Weston-McEwen pressure defense force Irrigon to turn over the ball more than they would usually. Weston-McEwen held the Knights scoreless for the opening period and the first minute of the second. Scorers for Weston-McEwen Oshana Sampson and Jennifer Thul. The Tiger-Scots led by 14-0 at the end of the first. The Knights finally got on the board just over a minute into the secon period on a three pointer. Scoring for the Knights included freethrows by Amber Cruz and a layup by Staci Stanger following a steal. Nicole Zeller for the Tiger-Scots had a good period. Weston-McEwen led at halftime 23-6. 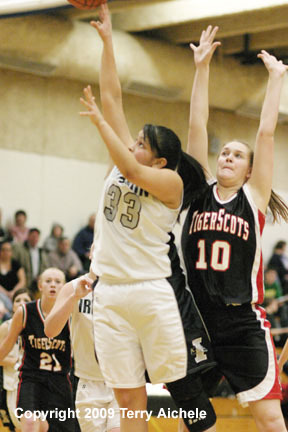 Irrigon outscored Weston-McEwen 12-9 in the third period but the Tiger-Scots still held a commanding lead. Noelle Wright, Amber Cruz, Kim Campos, Kendra Kimble and Breena Tolas all scored for Irrigon in the third period. Weston-McEwen led at the end of the third period 32-18. 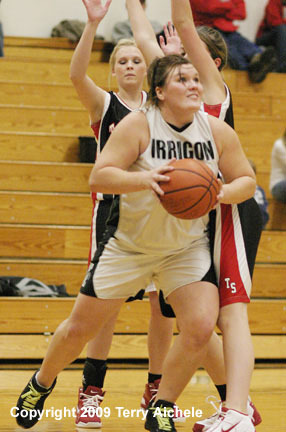 LEFT - Noelle Wright of Irrigon with the ball. 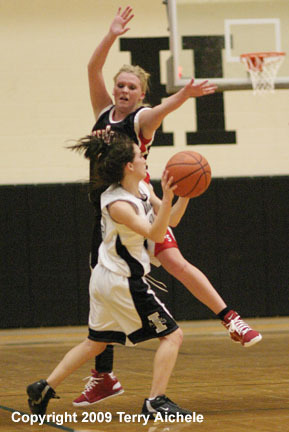 RIGHT - Staci Stanger of the Knights races down the court. LEFT - Adriana Sanchez, left and Staci Stanger, right of Irrigon apply some pressure to Jade Snively of Weston-McEwen. 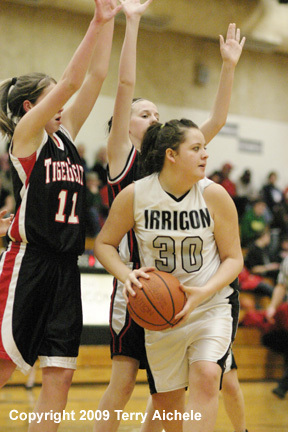 RIGHT - Amber Kramer of Irrigon looks across the court to teammate Noelle Wright. 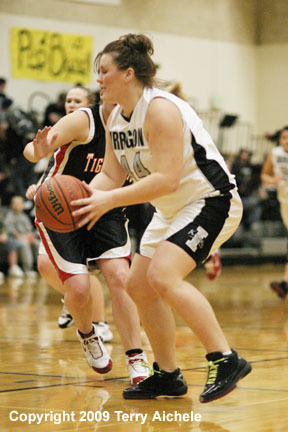 LEFT - Noelle Wright of Irrigon drives towards the basket during the game on Friday night. RIGHT - Kim Campos of the Knights takes a shot. 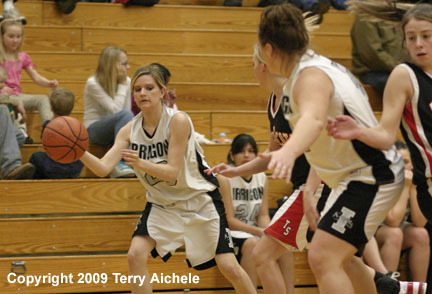 LEFT - Cheyenne McKenney of Irrigon looks for someone to pass to after being double teamed on a drive to the basket. RIGHT - Staci Stanger of Irrigon comes up with the ball following a battle for possesion between the Knights and Tiger-Scots.